Skid Crease | This “Resistance” is Futile! Skid Crease | This “Resistance” is Futile! Whether it be scripted in an X-Men comic, spoken by the Borg collective in a Star Trek movie, or spewed in an Ann Coulter rant, villains love to intone the phrase, “Resistance is futile.” In reality, resistance is rarely futile, it just sometimes takes generations to correct the damage. 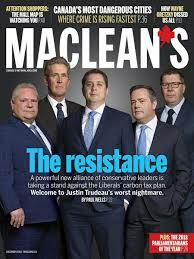 Trumpeting the title; “The resistance” Maclean’s magazine published their December 2018 issue featuring a cover photo with most of the political fossil fools in Canada: Doug Ford, Andrew Scheer, Jason Kenney, Scott Moe, and Brian Pallister. A collection of provincial and federal climate change deniers and skeptics who are sabotaging any hope Canada had for a national Climate Change strategy. If there is any “resistance” here it is to the truth. It is resistance to scientific literacy and science based policy decisions. It is a sacrifice of the environment to the economy, to the corporate power and profit of the oil, gas, and coal lobbies. This comes at the same time that the US Climate Assessment Report – compiled with help from numerous US government agencies and departments – contradicts the White House Trumpian view of climate change as a hoax perpetrated by environmentalists with a political agenda. This report warns of dire consequences to the U.S. economy, human health, and national security if policies to mitigate accelerating climate change are not enacted immediately. This comes at a time when Brazil elects the far-right Bolsonaro as its populist president who wants to pull Brazil out of the Paris Agreement on climate change goals. And in Mexico we have the newly elected left-leaning President Obrador walking a double-edged sword between environmental security and the economic benefits of oil. There is not a single industrialized country in the world that is meeting its commitments to the Paris Agreement. Canada is nowhere close to reaching its greenhouse gas reduction goals. True, some European and African countries and individual districts and states and provinces have made valiant efforts in reduction. But the world collective is heading towards a 5ºC temperature increase by the end of this century. That will be catastrophic for both the ecology and the economy of this planet. This is a nothing less than a war between the needs of the global commons and the special interests of a wealthy few. “When war comes the first casualty is truth.” This is seen clearly in the denial by many of our political leaders in the truths of scientific research and indigenous wisdoms . It is also seen in the erosion of social justice and economic policies designed to protect the most vulnerable in our society. it is seen most chillingly in the death of Jamal Khashoggi and the lack of unanimous political leadership to bring to justice and hold to account his murderers. Bear witness. This was the world leadership saying, “It’s too bad that a Saudi Prince ordered the murder of a Washington Post journalist speaking out for human rights, but we have to consider the economic benefits of doing business with an oil rich country.” The President of the United States refuses to listen to the recordings of the murder, refuses to accept international and his own intelligence agencies assessments that the Crown Prince of Saudi Arabia ordered the murder, and basically condones the political assassination of dissident journalists. This is the same president who calls journalists “the enemies of the people.” This is the same president who gives birthday cake smiles to President Putin of Russia, while failing to honour his own fallen soldiers. This is the same president who denies accelerating climate change impacts in a fire-ravaged California, proclaiming, “Let them rake leaves!” No courage, No integrity, no empathy, no reality, no leadership. The federal cycle in Canada is coming up soon; by 2022, our next election cycle in Ontario, I will be in my mid-seventies. My youngest grandchild will be just turning seven. As the end of the century approaches, at the point when these climate catastrophes will be peaking, he will be my age. He may by then have children and grandchildren of his own. Hopefully by then, the sins of myopic madmen will be only the subject of nightime “never again” cautionary tales. Hopefully by then, the real resistance, the wisdom of seven generation elders and the actions of caring and intelligent people will have restored some balance of love and empathy and stewardship for our Home Planet. That kind of resistance is not futile. Great thoughts with a still positive ending. The only thing is that Khashoggi worked for the Washington Post. only be for selfish reasons: $$$$. At least ,U.S. scientists have been able to publish their findings. I recall that no scientist in government was able to publish dire facts during Harper’s rule. When will those who can feel the summer heat, the intensity of the or storms. the fires and the floods stop supporting users.